A ready-to-use timber product planed on all four long sides to the finished sizes you provide. Supplied slightly over length to be cut down on site. Enter your details to get prices, then add to basket to buy or save as a quote. Planed Iroko is supplied with a planed finish on the four long sides and rough sawn on the ends. The boards are slightly over length so that you can cut them down to the size required. Iroko has a golden-brown colour with an interlocked grain and is a very durable timber with many uses. Our Planed Iroko is ideally suited for boat building, light flooring, interior and exterior joinery, window frames, sills, stair treads, fire proof doors, lab benches, furniture, carvings piling and dock and harbour work. As an FAS grade timber you know that you will be getting the highest quality timber. As an example of what can be done with Iroko view the Wagon Rebuild in our gallery where Jonathan rebuilt a brakevan using iWood Supplied Iroko. As an African timber planed Iroko is one of the few products that we can offer as FAS quality. To be classed as FAS grade the Iroko we supply musty meet strict regulations on both faces. At iWood Timber Merchants we have built our reputation on supplying quality timber, ensuring you have the greatest percentage of usable Iroko planed timber possible from your order. Our timber is imported straight from sawmills on the continent. Our usual lead times are therefore 14 - 17 working days. The availability of 194mm and wider European Oak is limited. 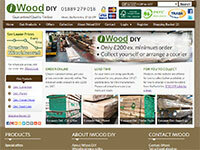 Please email your requirements to enquiries@iwood.co.uk and we can check availability for you.